The big move is Lyn and I are planning a move to Chicago by November, to be closer to our three children and four grandchildren, and so Lyn does not have a two hour drive to and from work and can more easily commute to Minneapolis to support her mother 95 and aunt 89. We will be part of Living Water Mennonite Church, where the Lord has given us many friends recent years. I have never lived in the city. In my head this seems clearly the right thing to do, though I find it emotionally challenging when I think about leaving Plow Creek community and rural life and moving to the all the noise, cement, and people of the city. We will be in Rogers Park, six blocks from Lake Michigan, which is consoling. I will continue my peace work with the support of the church there. I welcome your prayers for this transition.The unity between Lyn and I on this has been a bonus gift. "David, how is it going in the Fellowship of Reconciliation booth?" He responded, "I am finding it a real challenge to respond in a peaceful way to these 'Old Testamenters' who keep reminding me about how wrathful God is, and should be!" David calls himself a "neo-theist," meaning he used to be an atheist, but he isn't anymore. We have become very good friends over the many years we visit at Cornerstone. I have tried to encourage them in their work, and he often reminds me, "You saved us from getting thrown out of the fest one time." A few days later, I said to David, "I would like to share with you something we have been using in our devotions that has been helpful to us in our CPT booth work. I think it might speak to your struggle with people that disagree with you. It is from Romans 14:1: 'Welcome with open arms fellow believers who don't see things the way you do. And don't jump all over them every time they do or say something you don't agree with—even when it seems that they are strong on opinions but weak in the faith department. Remember, they have their own history to deal with. Treat them gently.'" David responded, "Wow, where did that come from." I answered, "The Message Bible, by Eugene Peterson." He said, "I will have to get one of those; let me write down the name of the book." One of the many people who mentioned how they have appreciated being on my mailing list said to me, "I work for Starbucks and I have been giving staff and the mangers little lectures about what is going on in Colombia, things I learn from your letters. It seems appropriate since our coffee comes from Colombia. Thanks so much for your letters; I thought you would appreciate knowing this." I responded, "Thanks very much, that is very encouraging to hear." I gave a slide presentation in Sterling recently to a peace coalition that went very well. Had a lot of good questions about what sustains my hope and prayer. They bought eight books. 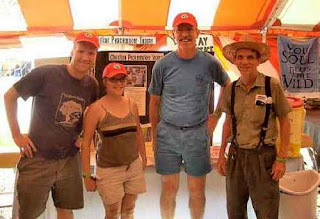 Below at our Cornerstone booth, left to right is Tim Nafziger, Charletta Erb, Rod Orr, and myself. Two hundred sixty-eight people signed up for to receive our letters this year. We sold about twenty books, and normally we sell one or two. Rod said, "If they read a book it will have much more impact than if they just read one of our pamphlets, so that is very good." Because of the economic situation, giving to support my peace work has gone down. Pray it will keep up to my needs and the need for peace in the world. Places to share my slide presentations close by here before we move to Chicago. Pray they open up. -So far local venues are a nursing home, a Nazarene Church, 2 libraries, and 4 days at the county fair. -In Iowa, 9/13- 9/17 7 times at Iowa Mennonite School. , 2 peace groups & English River church of the Brethren.